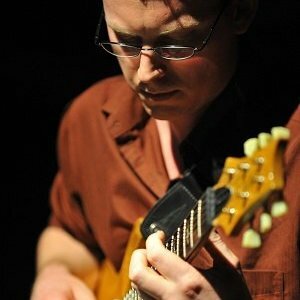 Canadian guitarist and pedagogue Dr. Matthew Warnock has been awarded degrees from McGill University (Montreal) and Western Michigan University (Kalamazoo), culminating in a DMA in jazz performance from the University of Illinois at Urbana-Champaign. He served as a teaching assistant at both WMU (MM) and UIUC (DMA), and has held faculty positions at Western Illinois University and the Interlochen Arts Camp. Matt is currently on faculty at Western Illinois University and has previously taught at Blackburn College, Culver-Stockton College and the Interlochen Arts Camp. As a full-time lecturer at WIU Matt teaches undergraduate and graduate level classical and jazz guitar students, directs the jazz and classical guitar ensembles, serves as Executive Director for the WIU Guitar Festival and supervises the Community Music School guitar program. Outside of his regular teaching duties he has given clinics and workshops across the US, Canada and Brazil including Concordia University, the Merit School of Music, the Wisconsin Conservatory of Music, Algoma University and University High School in Tucson, Az, the Federal University in Sao Del Rei Brazil and Pro Music Academy in Belo Horizonte, Brazil. As a performer Matt has shared the stage with Randy Brecker, Jim McNeely, Slide Hampton, Stefon Harris and other jazz luminaries. He has performed in concert halls throughout the United States, Canada and Europe as both a sideman and leader, and has premiered or performed several new works for guitar written by classical composers Dr. Erik Lund and Dr. Eric Simonson. Matt continues to maintain a busy schedule of concert performances in both the classical and jazz genres throughout the US and Canada. Matt is also an accomplished music journalist and has authored books for both Mel Bay and Hal Leonard publications. His instructional articles, product reviews and interviews have been featured in Just Jazz Guitar Magazine and the Jazz Guitar Gazette among other publications. As well, he has been a columnist for Modern Guitars Magazine and is currently the Editor in Chief and member of the board of advisors for Guitar International magazine.